Hi there. Back today with the last of my projects made from my 2 Squared School Kit. I have had the most fun with this kit. I just set all the items on a tray and spent the good part of a weekend just being crafty with it. 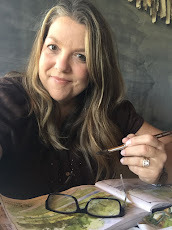 Such a fun way to spark a little creativity....limiting yourself to just a few items so you don't get overwhelmed...having a list of what you want to make....giving yourself a time frame to work within. 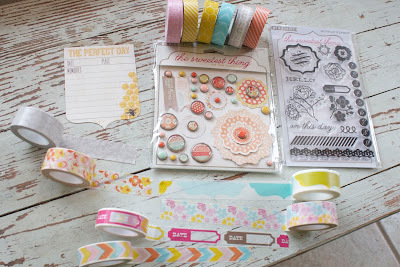 The kit uses Studio Calico Elementary papers and stickers + there are tons of fun items from my shop. 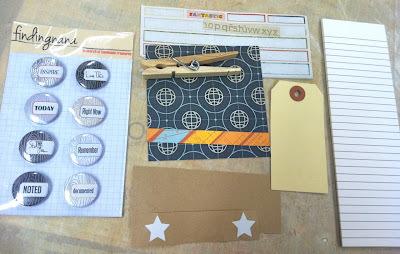 Be sure to scroll down to previous posts where I have lots of other school themed projects using this kit. 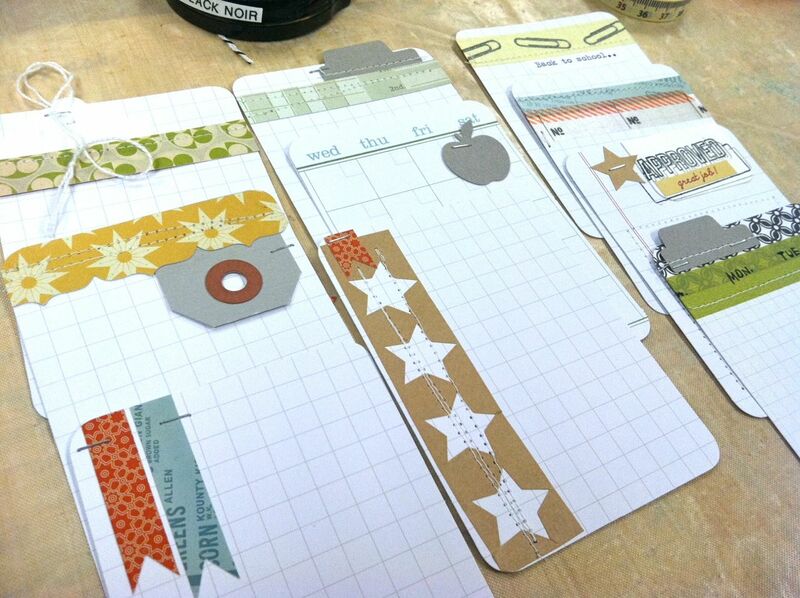 First up from today's projects are some embellished Project Life journaling cards. I set out the items below to use. And here are my finished journaling cards. I used the Project Life blank grid journaling cards as my bases. What I love about these cards are that they don't scream teacher/apple/school. There are subtle school themed items that aren't overwhelming for my high schoolers. I'll be reaching for these very soon when school starts back up again. Some of the photos I like to capture are of course the 1st day of school photos....but also shots of those first homework assignments, school books and papers, book bags, little snippets of homework papers. 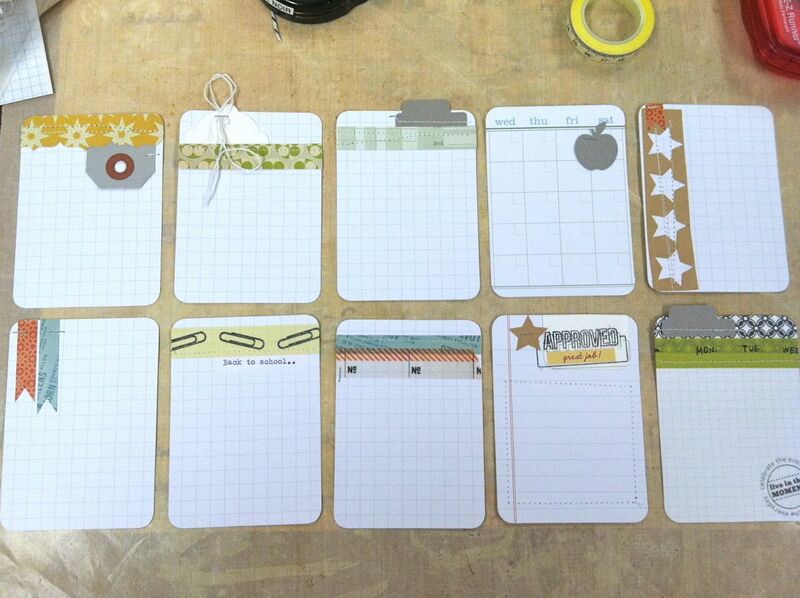 These little journaling cards will blend in so easily with my other pieces of Project Life. Next up on my list was a notebook. If you've followed my blog long then you knew I couldn't stay away from my beloved notebooks. Here's what I set out to use. 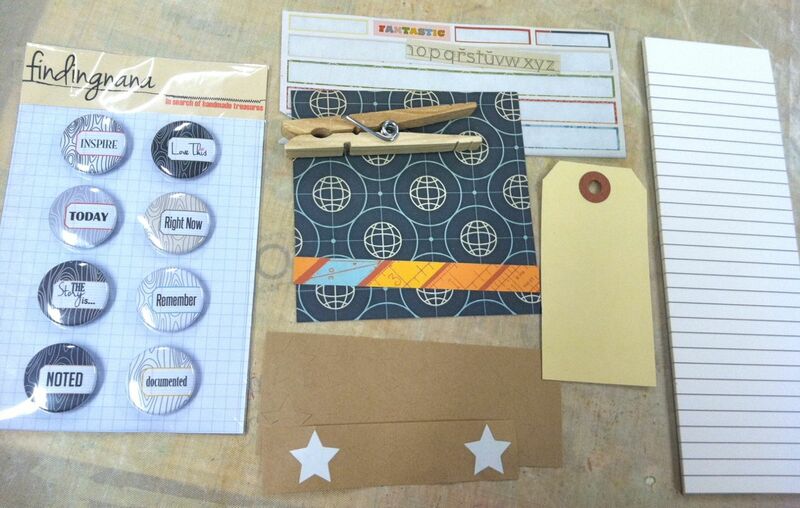 That wonderful packet of flair buttons are from my sweet friend Leena Loh. You can find her shop, Finding Nana, right here. It's packed full of the sweetest little goodies ever. And if you love Project Life inspiration be sure to check out Leena's blog. Her pages are total eye candy and filled with lots of details. So here's my notebook. I used 2 Papertrey notebooks that were specifically designed to coordinate with my Papertrey Take Note set. The perfect size for a work bag, purse or to tuck in a drawer. 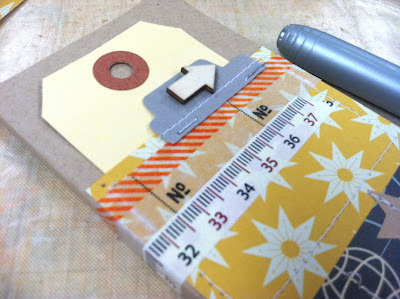 I used a Medium Manila Parcel Tag from the kit + one of the pieces of my punched tab garland that I made earlier on the top of the notebook. A few strips of Washi tape were added too. I stitched over pieces of the Studio Calico Elementary paper after a few of the Kraft star stickers were added in a grid pattern. 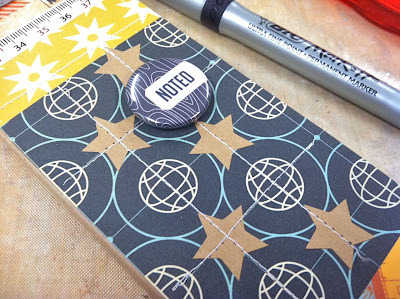 One of Leena's flair buttons was a perfect finishing touch to the circles on this fun patterned paper. Notebooks are always a great teacher gift and very much anticipated from everyone who knows their on my gift list. For gift packaging I used one of the large glassine sacks from the kit. You could also use my Large Kraft Sacks or my new Waxed Paper Sacks for packaging too. I tucked in the notebook and then folded the sack around to the back, securing with some Washi tape. 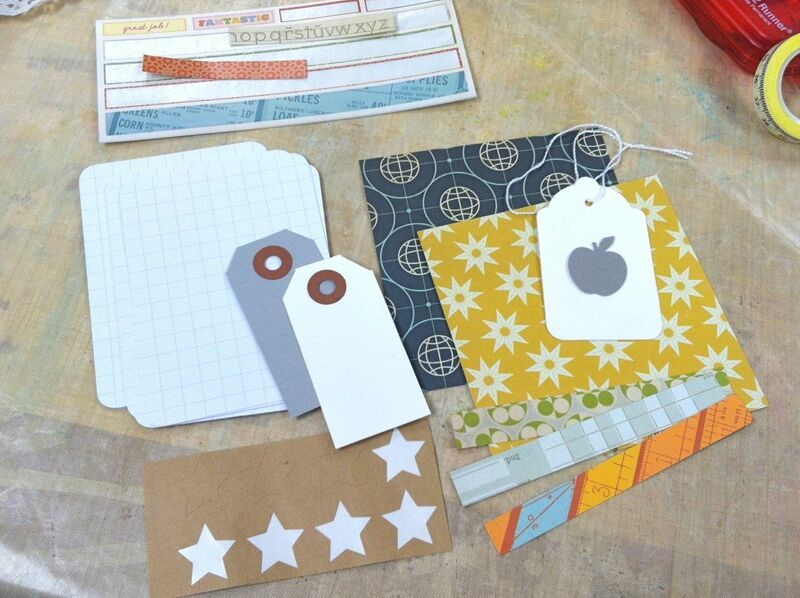 I used a Small Parcel Tag from the kit + some leftover patterned paper that I trimmed down to make some notched tags. I tied on some baker's twine and then secured the tags down with strips of Washi tape. Love these notebooks and may have to make some more. And here's the last of the scraps from the 2 Squared School Kit. I had just a few pieces leftover. If you click on the link to the kit you'll see that I used almost every single piece of it. Man, that was fun! Oh but wait. There's one more little project to show you that I almost forgot about. In the kit you'll receive a large clothespin. 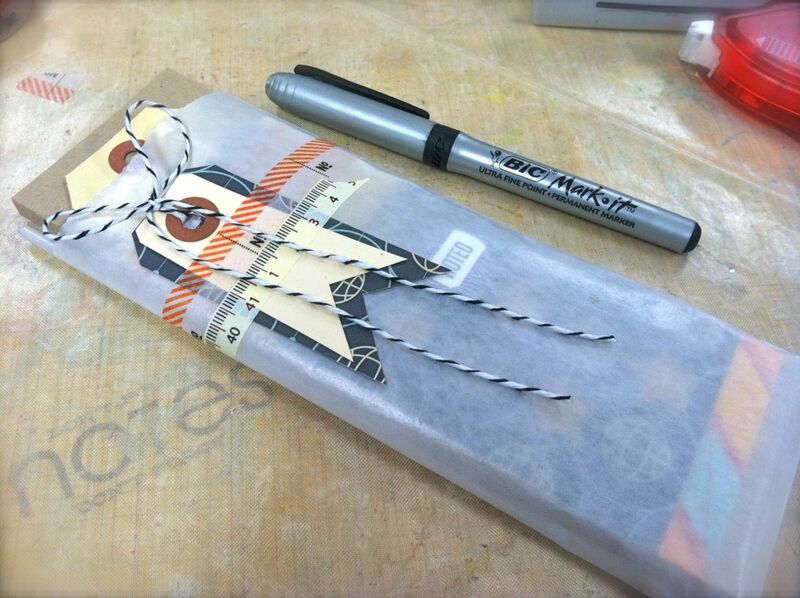 I used some Washi tape and wrapped it around the ends of the clothespin. Perfect width. I then added another one of Leena's flair buttons. That took all of about 1 minute to create. Perfect to go along with the notebook gift to keep papers nice and tidy. The flair buttons are perfect for this size of clothespin. So now that I've conquered the kit I thought I would show you all the goodies I made. Card sets, notebooks, bookmarks, gift sacks, journaling cards and more! I hope you enjoyed my projects and are inspired to create a few teacher gifts of your own. We can't forget the teachers. They spend a tremendous amount of time with our kids and are a huge influence. A little gift or card to let them know you appreciate their time is worth gold to them. I hope you take a little time to remember them this coming school year. :) I've got some of the 2 Squared School Kits left in the shop....perfect if you're looking to assemble some projects quickly. So what's next for me in the crafty department? 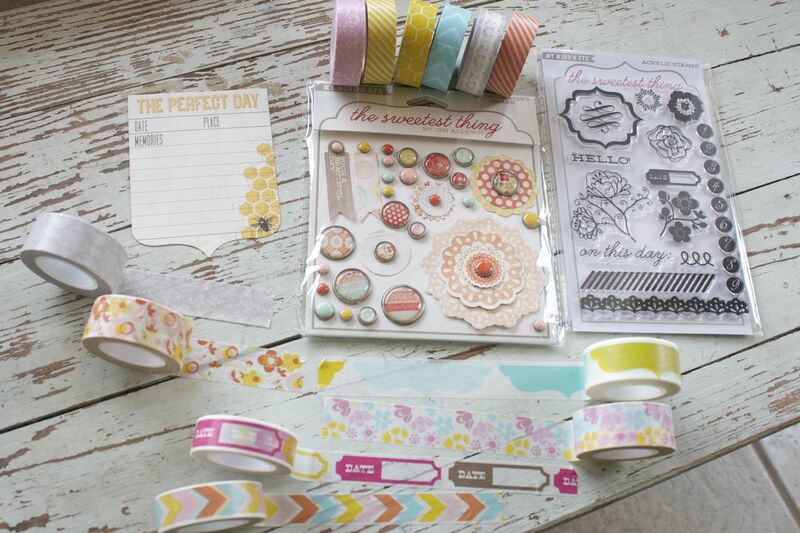 I have this beeee-U-TeE-FuLL lineup of My Mind's Eye The Sweetest Thing papers, stamps and accessories just waiting for me. Seriously folks, this stuff is total eye candy. So pretty and soft and muted. With a little touch of vintage. I want to hoard all of it. I want to order doubles so that I can hoard all of it. But I won't. I'm going to dig in the next chance I get! Just look at the fun accessories. The stamp set has adorable little flowers as well as the colorful brads. 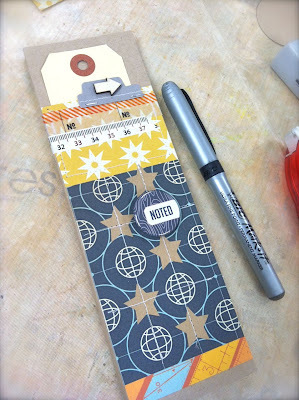 And the Washi tape. 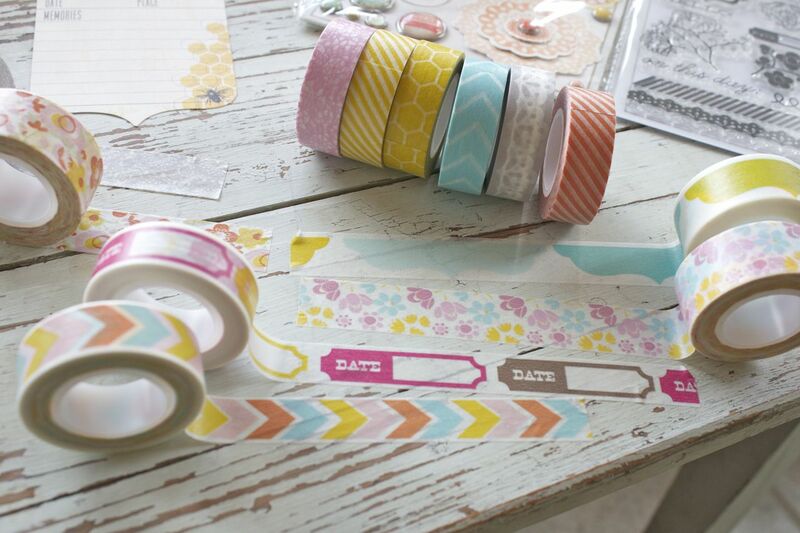 The Washi tape deserves it's own photo. I couldn't make a decision so it ALL went into my cart at 2Peas. 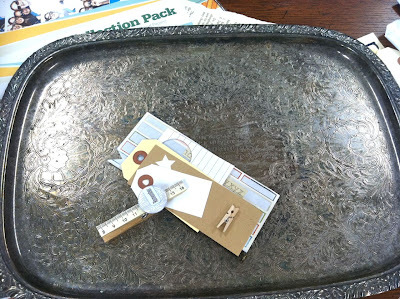 It's got a very smooth finish too and coordinates with the papers so wonderfully. Did ya get some? Here's your enabling alert! Well, I better scoot on our of here. The girls will be home from weights soon and then we're heading to the big city for some back to school shopping. The girls have grown so much, they need new everything! I may have to trade Washi tape for new jeans. I'm praying for great deals & patience in the dressing rooms. Wish me luck! Speaking of prayers, my family received a wonderful blessing on Monday. My dad went in for his 4 month post-op appointment. Blood work was good and his scans showed no signs of cancer. I can't tell you how wonderful it was to give my dad a hug and see the signs of relief on his face. I'll leave you with that. Have a wonderful, crafty day my friends. Love these projects!! I cant say that enough. I was so happy to see your notebooks again. I made several for my friends that are teachers in their back to school treat bags (many supplies ordered from your store). They love those notebooks, I am very beloved by my friends b/c of you and your inspiration in papercrafting. You know I just found out about Studio Calico's new card kits, just signed up. I e-mailed Amy and said that you and Dawn McVey are my inspiration for loving their products and making them into cards. I am hoping you will be a part of these card kits??!! Also, congratulations on your father, good news indeed. Life is good. I am so glad your father got a great report! That is a huge blessing!! Your projects brightened my day today. I can't say enough how much your posts inspire me. 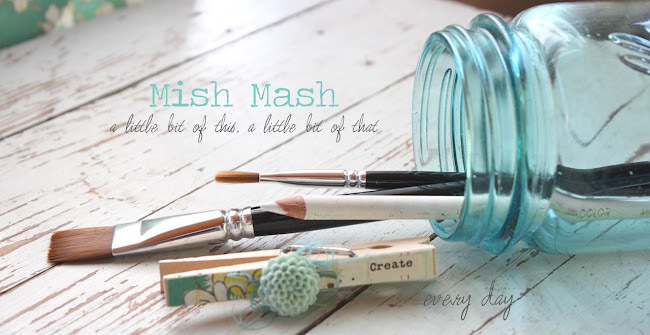 I nowhere near as skilled a crafter, but your posts get me all excited to dive in and create!!! Sigh....what fun. I love it all Mishie. You are so amazingly creative and talented. 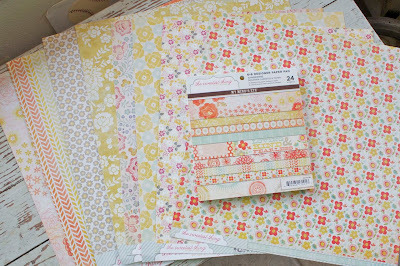 And, you've enabled me...gotta get some MME washi for sure! P.S. So happy to hear about your dad! Also, i want to thank you for my 2 squared kit. I got it in the mail yesterday and was sooo thrilled. can't wait to dive in. Big hugs from Castle Rock, CO! Yay about your dad...my grandmother is going thru some health issues now and it's scary..can't imagine it being my dad...I'm sure you had a huge sigh of relief as well! I love the clothes pin and the washi tape..I REALLY need to get some..I only have one roll..MME is one of my favorite lines..can't wait to see what you do with it. I always love your notebooks! Gotta love that MME paper. So happy to hear of your Dad's good news. Prayers are powerful. You are one talented girl. Like you I love retro office supply goodies! When I was home in Texas last week I purchased a 2 tier metal in out stand. So retro. I love it! Thought of you when I bought it! I'm still looking for Rolodex file systems. Old ones. Also the old receipt sticks. Can't think what you called them. My husband told me they had thrown some out at work. I was sad. Thanks for sharing! I like your these projects and I like your blog!! I've just started mine some days ago and I'm quite new to crafts... 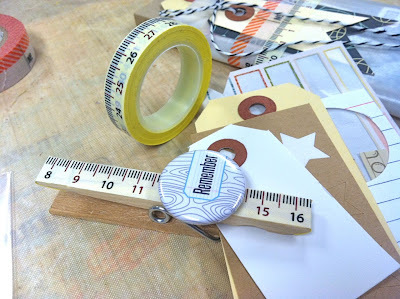 I've begun scrapbooking two years ago, and since then I've started trying new crafts... blogs are a way for me to catch new ideas, since in Italy those kind of crafts are not so popular, and your projects are really great! Great news about your dad, really great. I love your note books, after you made some years ago I ordered about 40 of them from PTI, yours are so inspirational. After another of your posts I went and ordered a ton of that MME just waitin waiting waiting for it to make the long journey to me. And yes I love Leenas buttons I nearly have them all and would highly recommend them. I love mine so much I find it hard to use them. Thanks Michelle always sooooo much inspiration. Gorgeous! Thanks for visiting my blog. 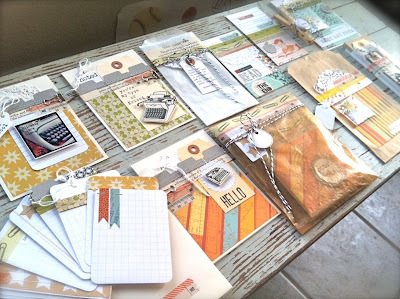 I adore your Project Life ideas and your kits are AMAZING!